So as I mentioned in a recent post, I’ve been occasionally practicing writing out the Thai letters.1 It’s really not that difficult, both because I’m already so familiar with them just from constantly looking at Thai writing over the last three years, and also because they’re really not all that complicated. I think that overall, the Thai letters are a bit more “frilly” or baroque than the Roman alphabet used by English — but (with a few exceptions) not by all that much. Letters like ม, น, ห, ก, ย, ล, บ, and ด (to name just a few) are so commonly used2 and so graphically straightforward that I never needed to practice them: I absorbed them by observation-only. There were a few hitches during this observational period, however, that required some conscious effort to untangle. For instance, I would sometimes get confused between ม, น, and ห — especially in fonts where the differences between these three letters are much less apparent than they are here. Similarly, differentiating between ว and า (which is a vowel, not a consonant) can be a bit tricky in some scripts. And although I’ve never been dyslexic, I would sometimes find myself struggling to differentiate between ว and ง — which are close to being inverted images of one another. The first is the superbaroque triad of ฎ ฏ and ฐ. They’re really not as bad as they look, though. ฎ and ฏ are graphically pretty much just ฦ with a kind of complicated looking squiggle written underneath.3 But looking more carefully at ฎ, the squiggle isn’t all that complicated: just a loop-like flourish. The squiggle below ฏ is similar but adds an inverted V (or maybe something W-like) before the loop. ฐ is, to my eyes, maybe the most complicated looking Thai letter; but it’s really just like the simpler จ that’s shrunk down a bit so it can sport a ร/ธ-like flourish on top. And the squiggle underneath it is almost the same as ฏ’s, except that it’s become disconnected from the rest of the letter and and had a little circle (the “head”) added to its start. The second group are the four “ligature-like” characters of ฌ, ญ, ฒ, and ณ.4 These each look like combinations of two other letters: ฌ looks like ถ and ม pushed together, ฒ looks like ต and ม, and ณ looks like ถ with น. Perhaps a bit less clear-cut is ญ, but it still kind of looks like maybe ถ combined with ข, with an extra diacritical mark below (similar to อั5) which has been permanently incorporated. So with this second group, it was just a matter of noting details like ฒ being the only one whose start doesn’t look like ถ (instead it looks like ต), or noting the difference between ฌ and ณ (the second “head” is placed differently, paralleling the difference between ม and น). And lastly, the third group consists of ผ, ฝ, พ, and ฟ, which resemble each other not only graphically, but also share some common (or similar?) sounds between them, to add to my confusion. (There’s actually another, fifth character, which looks somewhat similar — ฬ — but it sounds so different, plus the little loop at the top right is so distinct, that I’ve never found myself confusing it with any of the other four characters). Again, it comes down to stopping to actually look at the details of the letters, like does the “head” face in or out; does the “peak” in the middle come up to the top of the letter, flush with the level of the “head,” or does it stay lower down closer to the baseline; and does the last stroke extend up above the rest of the letter or not. Even though this third group is graphically the simplest of the three groups, it’s the one that I’ve had the most trouble with, probably because of sound similarities between some of the letters. I think I’ve basically got the hang of it by this point, but could probably use a bit more practice writing out these four letters in conjunction with playing their sounds from the กอไก่ app I’ve been using (see More กขฃ: Fun ‘N’ Games…). I actually like this video for other reasons: it goes over the “anatomy” of the letters (what the different parts are called), and uses lots of “spatial vocabulary” to describe where the features of each letter are placed/oriented. Plus, it’s just another way of reviewing the พยัญชนะ (cf. กขฃ — Music (etc) Videos and กขฃ — Ramble On! 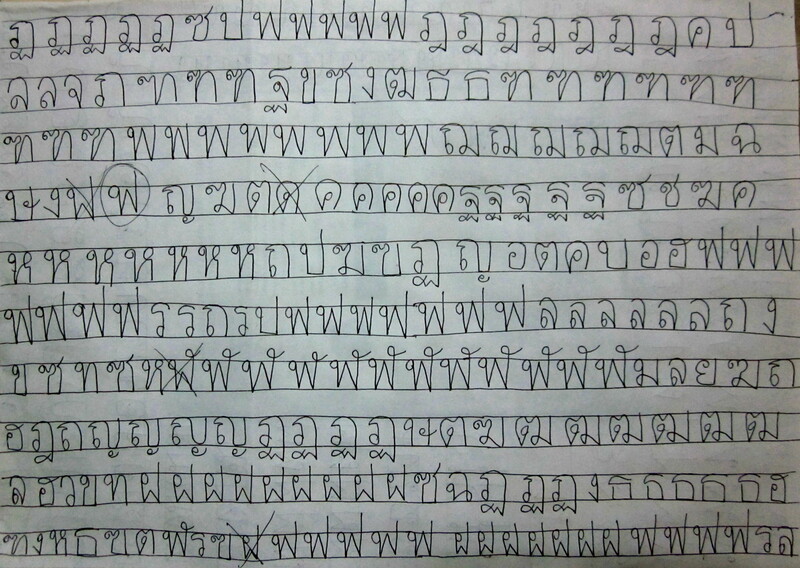 for other videos that review the Thai letters). Practicing the พยัญชนะไทย — I think I do a mean ฒ! Note how I hadn’t yet noticed that the “squiggle” underneath ฐ gets its own “head”. 1. The พยัญชนะไทย, typically translated as the “Thai consonants”; though on second thought, maybe the translation is a bit misleading. English consonants are just that: they represent consonant sounds. But the พยัญชนะไทย typically represent a consonant sound plus a vowel sound (like ka, ga, me, do, etc). สระไทย is usually translated as “Thai vowels” but I think that’s also misleading: these are symbols written next to the พยัญชนะ that change the vowel sound. English vowels can stand alone, but สระไทย only exist as attachments to the พยัญชนะไทย. My point is, the พยัญชนะ don’t really work the same way as consonants in English, and the สระ don’t work the same as English vowels; I think translating these terms into English can be misleading — but isn’t that usually the case? 2. There are some Thai letters that I’ve seen only very rarely, for example ฆ and ฑ. 3. ฦ is grouped with the สระ (vowels), but from the little I’ve seen of it in action, I’m not convinced that it behaves like the other สระ. Anyway, ฦ looks like a ภ whose final stroke extends a bit downward; ภ in turn looks like the basic ก with the addition of a “head” (the little circle at the character’s lower left). I think from fairly early on I noticed a number of letters that were, graphically speaking, variations on one other, such as ค and ศ, or ล and ส; but after starting to go through the Thai alphabet more thoroughly and also pay closer attention to the forms of the letters, I noticed even more “theme and variation” graphic similarities, such as between น and ฉ, or ร and ธ . Note however that there doesn’t seem to be any correlation between graphic “elements” and the sounds represented. For example consider the four characters ข, ช, ฃ, and ซ. ช is like ข with a crimp and extra little stroke at the end; and similarly so for the forms of ฃ and ซ; but there’s no systematic, predictable difference in sound that occurs with this graphic alteration. 5. อั: I’m here trying to indicate the “diacritical” mark written above อ, but there doesn’t seem to be any way to type the diacritical alone — I can only make it appear above a พยัญชนะ. 6. ก and ธ are the only two of the พยัญชนะ that lack a head, but I think it’s fairly intuitive (given that Thai is written left to right) that you start drawing them from their left sides. Pingback: กขฃ — Writing Out The พยัญชนะไทย | The World Speaks! I personally find it much easier to practice vowels and consonants separately. In groups of five to precise. Just write them over and over again; you eventually get it. I like how you actually learn the Thai terminology for aspects of the writing system! It makes it a lot more interesting to learn, I bet! I’m also probably a pretty atypical language learner; I spent a long time not studying the writing system, just passively absorbing it. In fact, even before I set out to systematically learn the writing system, I used to occasionally jot down things in Thai, which I could do without too much trouble because I’d already gotten fairly familiar with a lot of the letters. So when I did decide, alright I’m finally going to really learn the alphabet, I didn’t need to give equal attention to each letter. Some letters I already knew; with others it was a matter of learning the name; with still others, I had to take a more careful look at the graphic form of the letter so that I’d actually be able to write it out. Then there were lettersI had to look at more closely so as to learn to distinguish them from others that were similar looking or similar sounding. I think if I were setting out to learn the writing system on day one of my encounter with the language, I would have had to go about it very differently.